what you need to do to help us make sure it does not happen again. Normally we would be a bit more subdued than this when commenting on the performance of the Victoria Police, but this particular officer deserves the pasting he is about to get. Superintendent Craig Gillard has responsibility for providing operational support to Victoria Police’s operations in Western Victoria. 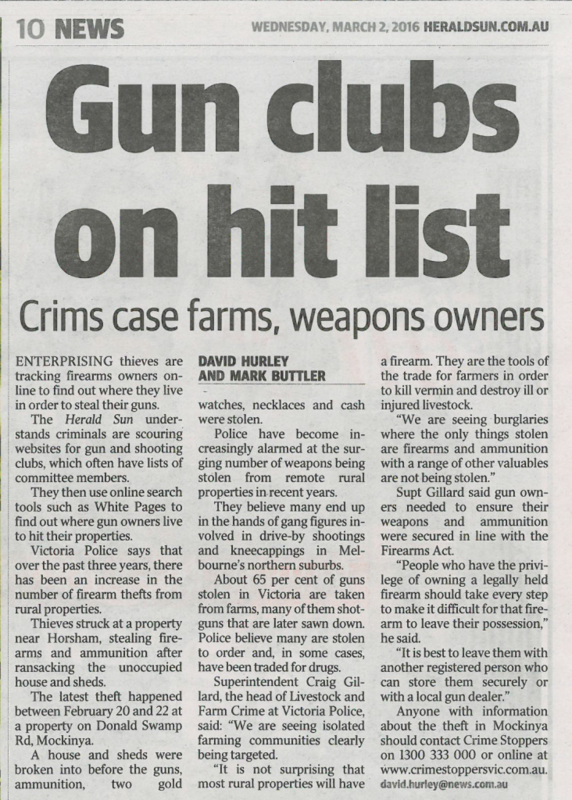 He appeared in Wednesday’s edition of the Herald Sun telling readers how easy it is to steal guns from gun clubs and gun owners by looking committee members up in the White Pages. The stats he quoted come from no known source. They contradict data obtained from our registry, VicPol’s Licensing & Regulation Division (LRD), which raises serious questions about the claims he made. Also of concern is that the regulation of firearms does not fall in his area of responsibility, but that of another Superintendent. If Gillard’s name seems familiar, it was because he said much the same thing last November when he told the media about firearm safes on rural properties, “On a good day, I can rip that open with my teeth”. Hence the monkier of Jaws, from the Bond series. In both articles he spoke about stealing guns ‘to order’ and trading some for drugs, so this latest story is little more than a repeat of his earlier story but with a different opening. In fact he also made similar claims to the Ballarat Courier in 2014. Yes, some firearms have been stolen, but the data from the LRD shows how inaccurate and offensive Superintendent Gillard’s claims are. Apology 1: Shortly after the November story, Police Minister Wade Noonan, distanced himself from Gillard’s comments in that story. Apology 2: Earilier this week a representative from the LRD similarly distanced themselves from Gillard’s comments following the more recent article. While we’re confident it will be followed up at the appropriate level, it exposes an inappropriate contempt among some in senior ranks towards firearm owners which has been around for years. Statements like these are not only offensive to the Victorian shooting community, but disrespect the reporting structures within Victoria Police, and with that, the goodwill we are building with the LRD. We’ll be writing a letter of complaint to the Chief Commissioner, Graham Ashton, protesting the statements that Superintendent Gillard has been making and making recommendations to stop this from happening again. We’ll also be seeking his commitment with respect to the processes VicPol uses when seeking amendments to firearm laws. I refer to comments made by Superintendent Craig Gillard in the Herald Sun on 3 March with respect to the security of privately owned firearms. Superintendent Gillard’s comments were not only alarmist but made outside his area of responsibility within Victoria Police. It is my understanding the Licensing & Regulation Division distanced itself from his comments the day the article appeared. This is not the first time this has happened: in November Minister Wade Noonan similarly distanced himself from comments Superintendent Gillard made regarding firearm safes on rural properties. Neither of his claims were based any verifiable facts or data. 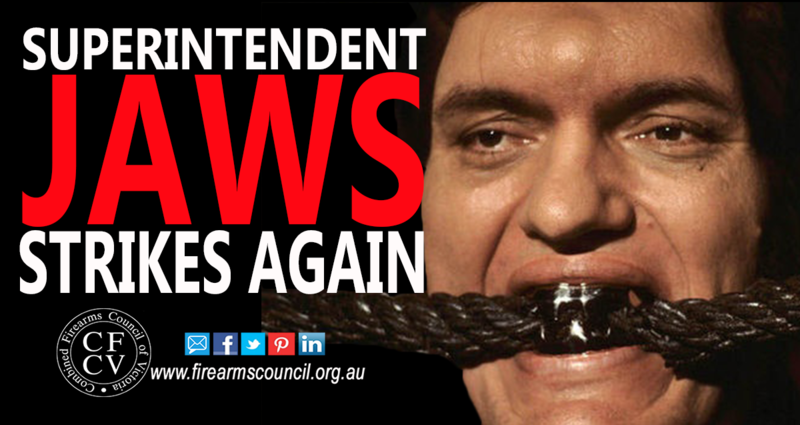 In the circumstances I call on you to take whatever action is necessary to ensure Superintendent Gillard is not able to make any comments on firearm related matters without first consulting the Superintendent responsible for LRD. I understand the Combined Firearms Council of Victoria is considering preparing a formal complaint on this to you, which will include recommendations for your consideration. At our recent shooting industry forum, we identified control over police command as one of the key challenges for our industry this year. It took only a few days for us to be proven right. We hope police commands does what it needs to do to make sure this cannot happen again. An apology to the VFCC behind closed doors doesn’t help one bit. His comments were made public hence the apology should be a public one!!!!! Get fair dinkum guys!! We need to see Victoria Police take public responsibility for the actions of their senior members. An apology should be issued to Victoria’s shooters and published on their website for all to see. Other groups would never accept these backroom apologies, why should we? I would share this, but it is NOT this article that shows, just the site. personally i think the apology should be put front page of all the major news papers and on TV news every channel not just on their web site. make it full blown public what these cretins are up to.